FC Bayern's new shirts have drawn plenty of comparisons with those worn by the Bavarian giants in a previous era. 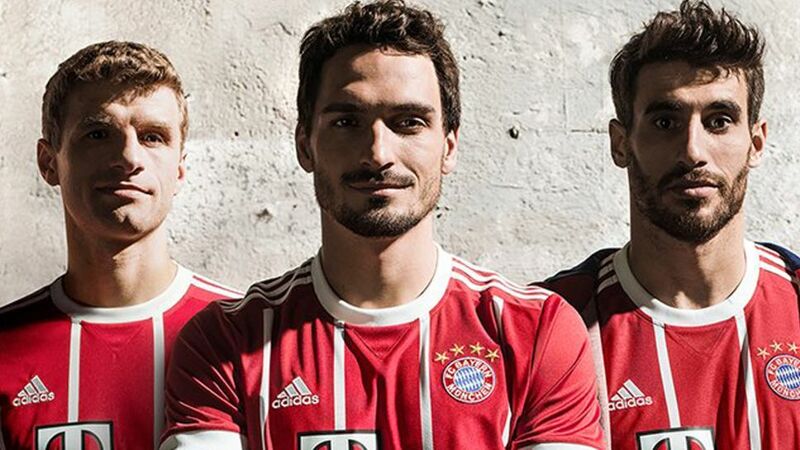 Bundesliga champions Bayern Munich have drawn on inspiration from the club’s glorious past in helping to find the design for their 2017/18 kit, which the team will wear in their last game of the season this weekend. Download the official Bundesliga app - the essential Fußball fan experience! Featuring white stripes over the club’s traditional red colours and the famous motto ‘mia-san-mia’ – or, ‘we are who we are’ – on the collars, Bayern’s adidas-designed wear was unveiled ahead of Saturday’s encounter against Freiburg at the Allianz Arena. “It obviously makes you think of the likes of Gerd Müller, Franz Beckenbauer, Uli Hoeneß and Karl-Heinz Rummenigge,” Bayern attacker Thomas Müller said of the kit’s striking resemblance to that worn by the hugely successful Bayern sides of the 1970s. It's time to update your Offical Fantasy Bundesliga team ahead of Matchday 34! Having just won an unprecedented fifth successive Bundesliga title, Bayern will look to pick up where they left off once the 2017/18 season gets underway following the summer break. The Bavarian giants will also be gunning for European glory in the Champions League and domestic success in the DFB Cup and hope that lining out in their new apparel will inspire them to achieve plenty of glory in the coming campaign. “You have to feel comfortable in a kit. It has to have some connection to the club and give you a good feeling,” Müller concluded.